Our diagram shows the constellation Leo the Lion for about 9 p.m. to 10 p.m. tonight. At this time, the Lion will be due south and at his highest point in the sky. Two distinctive star patterns make the Lion easy to identify. Leo’s brightest star – the sparkling blue-white gem Regulus – dots a backward question mark of stars known as The Sickle. 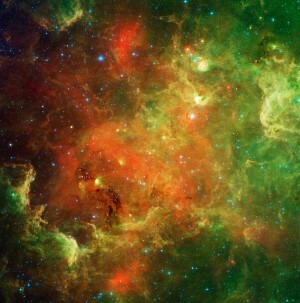 If you see a Lion in this pattern of stars, the Sickle outlines the Lion’s mane. A triangle of stars highlights the Lion’s hindquarters and tail. 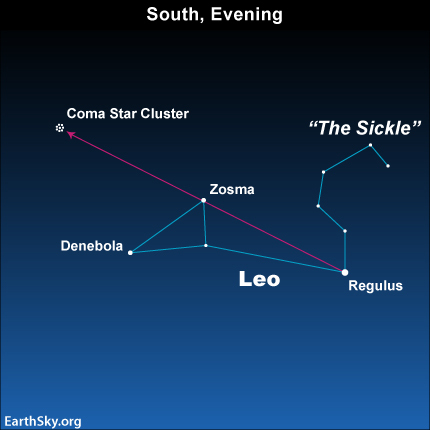 Denebola, the name of the outermost star in Leo, is an Arabic term meaning the Lion’s Tail. Now try to star-hop to the Coma star cluster from Leo the Lion. Draw a line from Regulus through the top star of the triangle (Zosma), and go about twice this distance to locate the cluster. Although the Coma star cluster (Melotte 111) is visible to the unaided eye in a dark country sky, sparkling against the background of the Milky Way, you may need binoculars to see this loose tangle of stars if your skies are beset by light pollution. This open cluster of about 100 stars lies some 288 light-years distant, and shines in the constellation Coma Berenices. There is another cluster, the Coma galaxy cluster, in Coma Berenices, made up of galaxies and invisible to the unaided eye (or even in a small telescope). In ancient times, the Coma star cluster was the Lion’s tufted tail. Larry Sessions tells the story of how the Lion lost its tail in our April 27 program.